JAKARTA - Yasuhiro Koseki shook off a slow morning heat to win the men’s 100-meter breaststroke gold from Lane 1 at the Asian Games on Wednesday. The 26-year-old, who won in 58.86 seconds, completed a 100-200 breaststroke double in Jakarta. With the 50 coming up Friday, Koseki has a chance to earn a hat trick of golds in the stroke. Japan saw more gold later when Daiya Seto clocked 4:08.79 to beat reigning Olympic champion Kosuke Hagino by 1.51 in the men’s 400-meter individual medley. China’s Wang Shun was third. 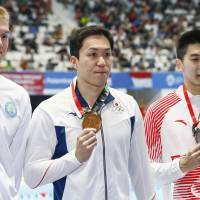 Seto’s gold was his second at this edition of the Asian Games and fourth overall. “It was so tight my head was pounding, and that was my plan,” said Seto. “I have had a lot of comfortable races recently, and all the easy races I have had would make it difficult for me to win gold in Tokyo. Natsumi Sakai won her second gold of the games when she clocked 59.27 seconds in the women’s 100 backstroke final. The 17-year-old reigning world junior champion beat her compatriot Anna Konishi by 0.40 and China’s Chen Jie by just over a second. Japan continued a superb night in the pool when its men’s 4×100 freestyle squad — made up of Shinri Shioura, Katsuhiro Matsumoto, Katsumi Nakamura and Juran Mizohata — beat China by half a body-length. The Japanese set a games record of 3:12.68 with Singapore finishing in third. Earlier Wednesday, Joseph Isaac Schooling of Singapore, the men’s 100-meter butterfly Olympic champion, took gold in the event in an Asian Games record 51.04-seconds. 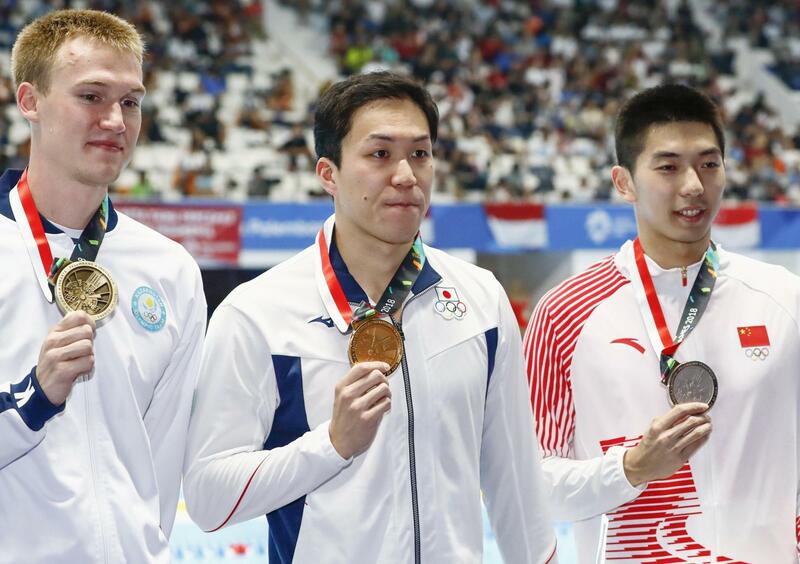 China’s Li Zhuhao finished second and Japanese veteran Yuki Kobori won bronze, his fifth Asian Games medal and second this year after his gold in the 4×200 freestyle. China’s Li Bingjie won a tight women’s 200 freestyle, establishing her winning margin with a strong final 50 meters as she held off compatriot Yang Junxuan. Yang stretched to the wall just 0.01 ahead of Japan’s Chihiro Igarashi, who won her first individual medal of the games in Indonesia. In the women’s 200 butterfly Zhang Yufei was too fast for the Japanese pair of Sachi Mochida and Suzuka Hasegawa. The Chinese swimmer touched in 2:06.61 with the silver and bronze medalists both more than 2 seconds adrift. In the mixed 4×100 medley relay, China held off Japan, in a games-record 3:40.45. Japan took silver, 0.76 back, while South Korea placed third, far off the pace in 3:49.27.